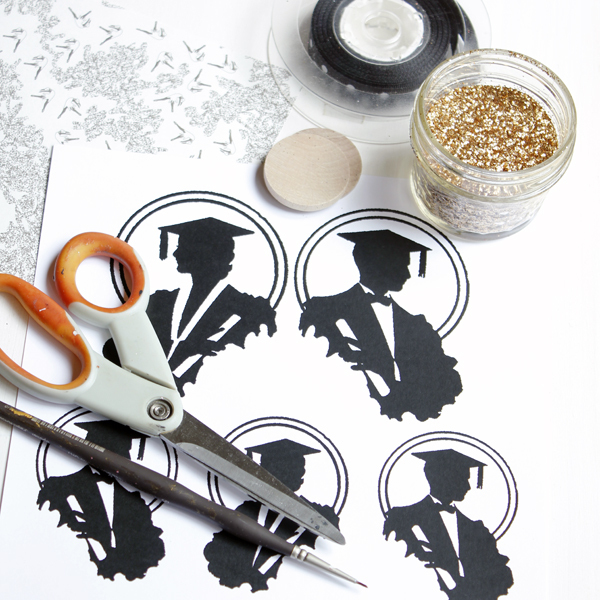 DIY Graduation Decoration with Free Printable! Hi everyone, how are you. 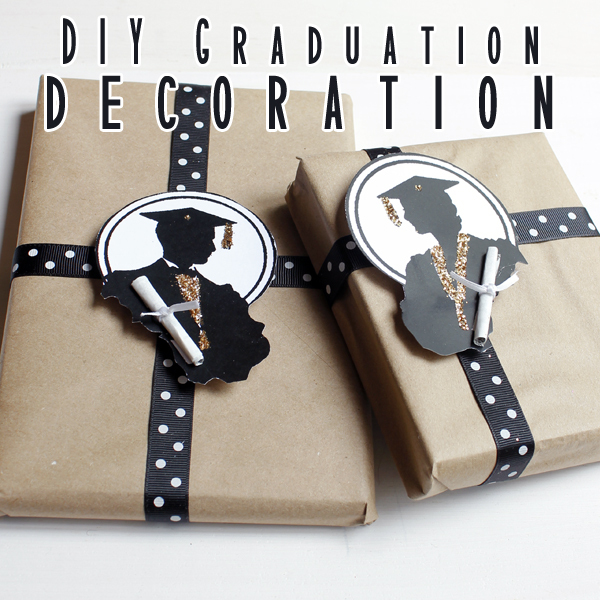 It’s Andrea from The Cottage Market and I am back with a quick and easy DIY Graduation Decoration for you! 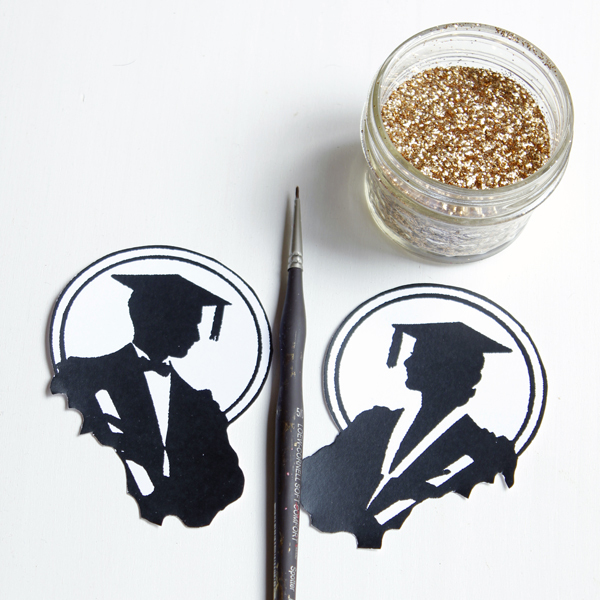 There are a ton of Graduations happening all around the world during the Summer Months and really all year…so I thought that you would enjoy this simple DIY with 2 of The Graphics Fairy’s newest graphics! You can find the girl here and the boy here. 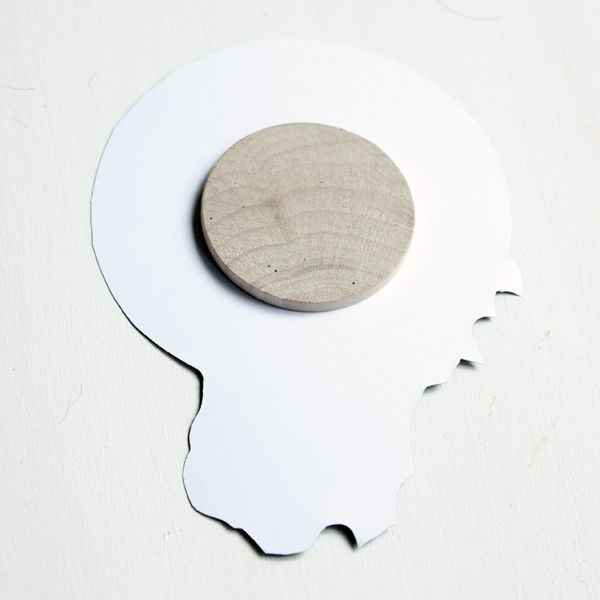 This little dimensional decoration is great for topping packages…making banners…homemade cards…decorating mason jars…creating napkin rings and so on and so on! Let me show you just how easy these are! The Supplies you will need are: Prints sized to what you will be using them for, a little wooden circle or square or any shape (this will give you the dimension you need), glitter of your choice (it is cool to use the school color if you can), ribbon for wrapping, the glue of your choice, a scissor, paper for the diploma. 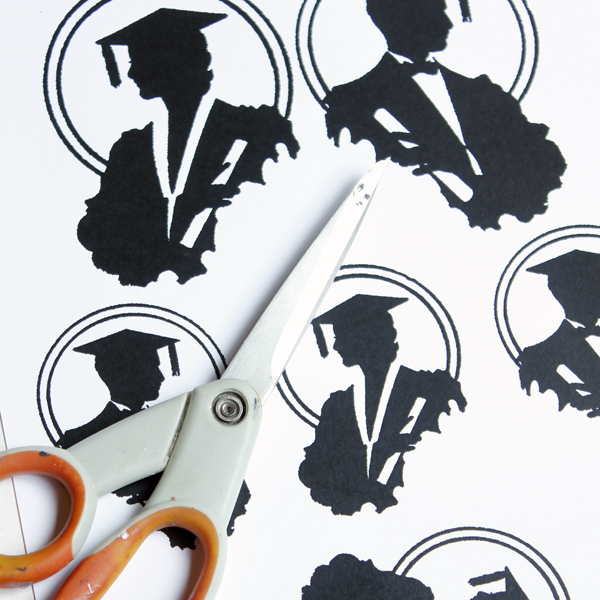 Now that you have your images printed..time to cut them out. The beauty is that you don’t have to be totally exact…you can always even them out! Cut the amount you need. 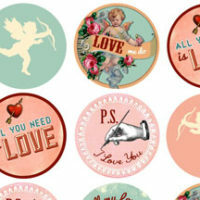 Now that you have them cut out…it is time to glitter if you choose to. 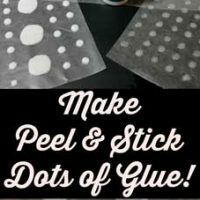 Just paint the area that you want to glitter with your craft glue…then sprinkle with glitter…then shake off the access and allow to dry for about 5 minutes. 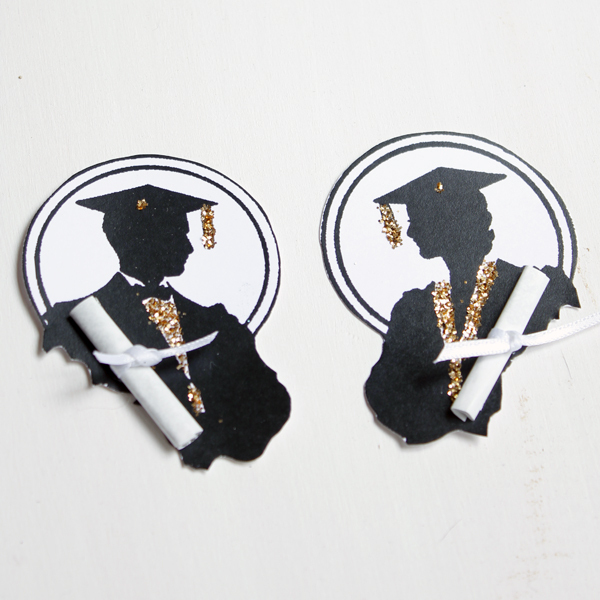 While they are drying…make little diploma’s to add a fabulous dimension. Simply cut a little piece of paper (I used this origami paper because it had some light black print and when I rolled it…you can see a little bit of black that looked like writing. 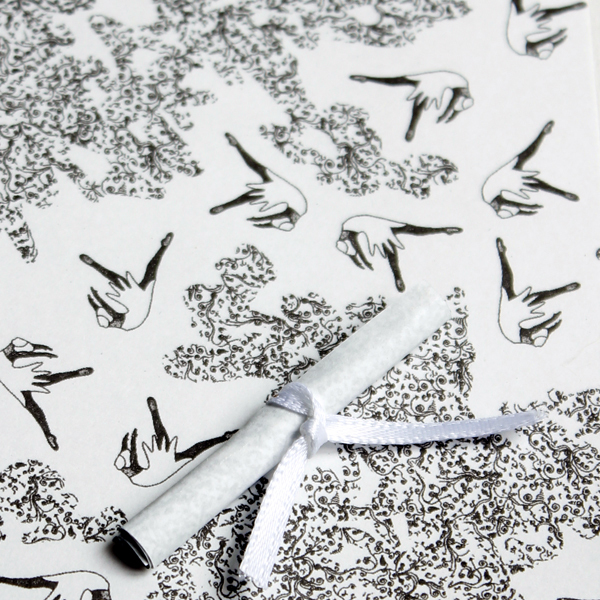 Just cut…roll…tie with a little ribbon and viola! Then turn them over…glue the diploma on (I used a dab of hot glue) and VIOLA…you are done!!! Now it is up to you what you would like to use them for! Just think of the possibilities I mentioned in the beginning…then there a million and one other ideas that you all have! Now wrap up some gifts and start some fun DIY Projects!!! 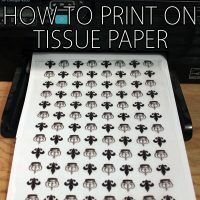 Hope you enjoyed this quick and easy little DIY Project and hope it sparks some ideas that you can do with other images from The Graphics Fairy!!! See you really soon…but if you would like to drop by and say hi…you will find me hanging out at The Cottage Market every day! Thought that you would enjoy this yummy treat…quick…easy…healthy and tasty! 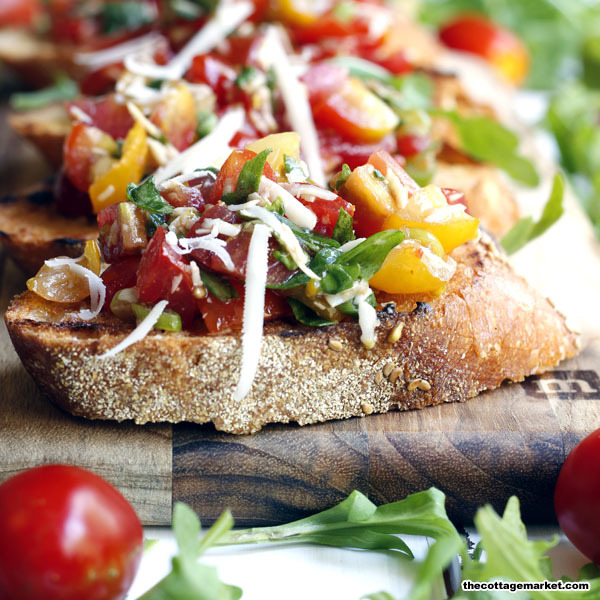 Bruschetta…Italian Style! « Public Domain Corkscrew Image! Thank you so much for the boy graduation decoration. I love it!!! Unfortunately I could not download the girl decoration just like it. It took me to a totally different page. Could you post the girl graduation decoration so that I can click on that and it will take me to it? Thank you in advance!!! I love your blog!!! Sorry about that Phyllis! I’ve fixed the link for you!